Even sharing the premise of the game feels a little like a spoiler. And while I don’t usually worry about spoiling things since it’s usually the journey that makes the story, in a quantum sort of way, spoiling things about this particular story does take away from the journey. So as spoiler-free as I can: this game follows the story of two brothers on a quest to get water of life to heal their ailing father. Rather than magical powers or physics-breaking artifacts*, the brothers overcome the obstacles deterring them through cooperation. Through and through, Brothers – A Tale of Two Sons is a game centered around a story. Also masterfully woven in are beautiful musical and visual arrangements. The gameplay conveys the core motif of the game: cooperation. Just like a good book or movie, after playing this game I wanted to talk about it, show it, and share it with as many friends as I could (which is a pretty large part of why I’m writing this post even though it’s a few weeks late to be of most use as a review). From delight to wonder to loss, this game conveys a full pallet of emotions without forcing any of them. It’s not some watered down children’s fairy tale by any means either. Brothers impressively and tastefully tackles hard topics that many games stray away from. To give just one example: at one point the brothers encounter a man who had lost his family in a fire and was questioning his life. Not only does it discuss the grief and pain present in that situation; Brothers also brings a mature and realistic word into making peace with that grief. In this way, Brothers tells that story in a much more holistic way than most games I have seen that broach that topic in the first place, which is already a small number. Oh, and did I mention that this is all accomplished without a word? There is no expository text in the game and every word that comes out of a character’s mouth is gibberish (or at least, not a language I understood). While this may seem like a lofty artist thing that doesn’t really hold value, the fact that literal word is unnecessary is a testament to the powerful, evocative qualities of the narrative. Rather than controlling one brother at a time, which may have relegated one brother to simply being a power-up used to clear obstacles, each brother has one analogue stick and one action input. And that’s it. No special attack combinations, no sprint, no skill menus, no jump button. Just walk and act. 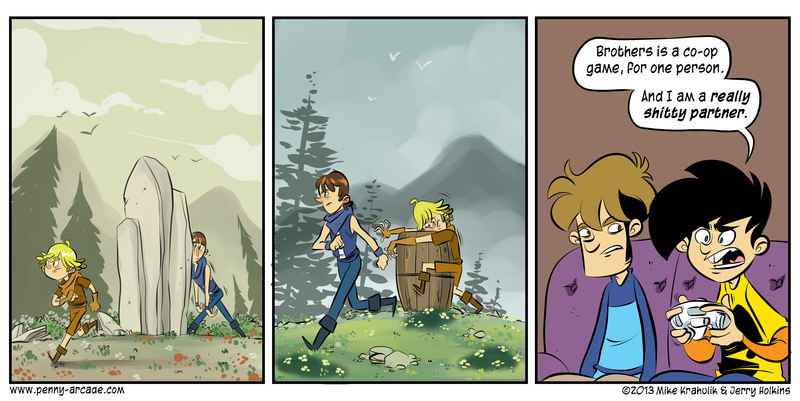 (click for larger) Why is that barrel in the second panel there? While this may sound simple, it can take a lot of getting used to. Most games condition players to control only one character at a time and while there were a couple of times where I fought with the controls, these few bumps never compromised the telling of the story. Further, because it was obvious what I was doing wrong, they weren’t really that frustrating. Instead, watching myself clumsily forget to bring one of the brothers along or mix them up gave me a new sympathy for players learning how to play video games. It reminded me of learning how to play first person games where you look around with one hand and move with the other without all the walking off cliffs and getting shot and feeling horribly inadequate. This “single player co-op” control scheme also provides many opportunities as well. Once I got acclimated to the controls of the game, it felt a lot like playing co-op with a friend who knew what I was intending to do at all times (and I still think that failure in Chapter 4 is your fault other Nathaniel!). As the brothers travel, they can interact with a number of the objects in the environment. Each brother may interact to the same object differently. While one brother may stop to smell a potted flower, the other may knock it off its stand. These differing reactions not only provide more to look at but also serve to highlight each brother’s personality. The environment also provides obstacles and puzzles for the player’s mind to gnaw at while playing as well. The difficulty ranges from checking that you can control the brothers without mixing them up to “pay attention so you can find the secret”. Mechanically the game is not very challenging. Many of the interactions simply required that the right brother hold the correct thing during the right time. Despite this, none of the obstacles felt repetitive because each one had its own little spin. The notable thing about the obstacles, however, is not their difficulty, but their cleverness and narration. While I never found myself stuck (which probably would have broken my suspension of disbelief), I did often find myself realizing that the clever solution that I had thought I cooked up all on my own was actually the intended solution. At the same time, after the sections where the brothers were separated, I did notice I was only too relieved once they were reunited. As with all games, the experience isn’t always purely determined by the way the game serves its primary aesthetics. Many of these factors are more neutral and hard to discuss as positives or negatives for the game. The story is very complete. I like that a lot, especially compared to many franchises I’ve seen that didn’t seem to have planned for the ending, or were forced to keep the ending open ended for the potential of a sequel or follow up. However, one side effect of having so much closure is that it reduces the replay value of the game. Even now, I can’t bring myself to go achievement hunting because the story is so well woven together that picking chapters just for one achievement feels disrespectful to the narrative. With this coupled with the fact that the game is fairly linear and lacking filler content, it would not be a good idea to expect that this game occupy a large amount of time. What to one person may be “this game doesn’t have very much replay value” may be to another “this game respects your time”. Personally, I lean toward the latter. For most experiences, I’m not very strict about avoiding spoilers. After all, for a movie or book or something, you’re still passively being told the story. Brothers has shown me that this does not always apply to interactive media. It’s one thing to watch a game preview or a first impressions video of this game, and it’s an entirely other thing to be extremely satisfied with yourself that you managed to have the two brothers walk side by side along a dirt road. Being able to experience the game as you interact with it makes a world of difference. So is the game worth $15? In some senses it pushes our understanding of what a game is, seemingly worrying less about provide huge and repeatable volumes of content and more about telling its story. Perhaps it would be better categorized as an interactive narrative, as there isn’t very much player choice involved in changing the outcomes. Regardless, this game provides an amazing and polished experience that I’d want to see more of in games today. The art, the sound, the feels. They are all authentic, appealing, and serve to better convey the story. And when it comes down to it, I think a couple of hours of quality entertainment is worth at least that much.